Bliss Cottage is an amazingly delightful north-facing property with panoramic views across Oneroa Bay and out to the Hauraki Gulf. This magic little hideaway is located at the end of a no-exit street and is perched above little Oneroa beach and Oneroa Bay - uninterrupted views make this the perfect holiday location on popular Waiheke Island . There is a walking track adjacent to the property leading down to the Little Oneroa Beach and the famous Little Oneroa Beach Store. The open plan kitchen/dining/living area is open plan is light and bright and with contemporary decor. There is a conservatory adjacent to the kitchen - which comes complete with all modcons including a gas hobb. The lounge faces north and has a wrap around sun-trap deck. 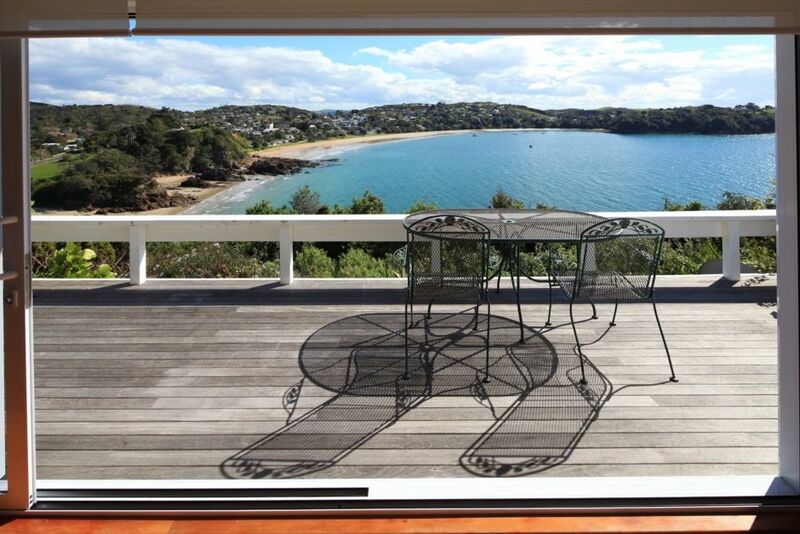 Enjoy the view from here across the bay and down to Little Oneroa and Oneroa beaches. The barbeque and outdoor entertaining area is in the well-kept private garden, which is also great for the kids to run around in. There is a TV/Rumpus room downstairs complete with a 50" LCD TV, an iPod Dock, loads of books and CD's and a lovely spa pool on the deck just outside. Relax in the spa with some great music in the background or the waves rolling in on the beach below. The master bedroom has a California King bed with en-suite bathroom and floor to ceiling mirrored double wardrobe. At the end of the hallway there is a second bedroom with a California King bed which can also be configured as 2 king singles depending on requirements and duplicate floor to ceiling mirrored wardrobe. There is a second bathroom across the hall. The covered carport comes with access to the house. Grab your piece of paradise here - Bliss Cottage is a wonderful place to retreat with the family or friends and especially great for the kids. We loved our time on Waiheke and Bliss Cottage is beautifully positioned and relatively handy to Oneroa, however, the linen was below par with no mattress protectors and ill fitting old sheets. The downstairs room clearly had water damage and was too musty to spend any time in. This property could be amazing but its let down by a lack of attention and cleanliness. We have lived in Auckland and usually make an annual return to Waiheke to catch up with friends and enjoy the island life. Unfortunately this time we did not get to stay long or experience Bliss Cottage due to family illness that meant we had to return to Australia on the day before we were due to check in. The owners had gone to a lot of trouble to make sure our stay would have been perfect and were very considerate of our circumstances. We would be happy to rebook this property. Fabulous location overlooking Oneroa Beach! Beautiful spot, lovely house. Thoroughly enjoyed our stay! A wonderful welcome and excellent hospitality. The view is amazing and the great weather we had meant we could have stayed all day at the cottage, but with little Oneroa Beach and the main beach a short tramp away, down some recently complete steps ( we didn’t count them) as part of the extensive Waiheke trails, we were keen to explore. We loved the spa pool in the evening. Downstairs needs some attention as the flooring has water stains / flooding. Lots of games, books and music but the view and sound of the ocean is all we needed. Thanks for the review and the feedback. We are working to clean the 1 metre x 1 metre stain on the sisal carpet in the corner of the downstairs room from when it got wet, unfortunately sisal can only be dry cleaned and we haven't been able to find a cleaner to do it therefore we will be replacing that corner shortly. I hope that it wasn't an inconvenience for what looked like an otherwise nice stay.